Performing this drive pattern is one method to simulate the TCM (ECT) malfunction detection conditions. Some malfunctions are not detected when the atmospheric temperature is less than -10°C (14°F). 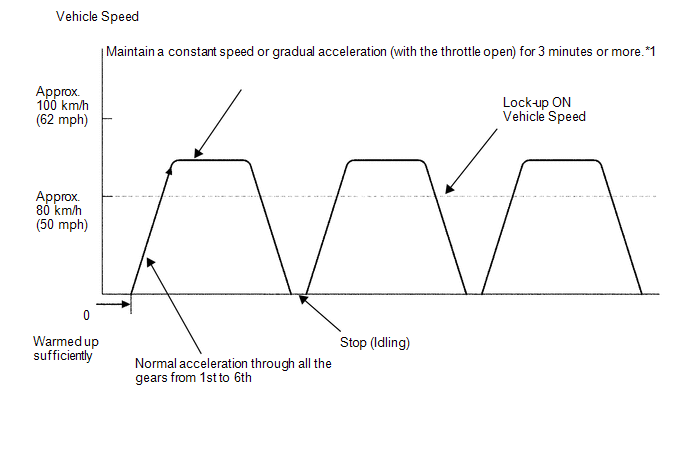 (2) Confirm engine braking using the S position. While driving with S6 range selected and 6th gear operating with lock-up on, move the shift lever toward "-" to downshift from 6 to 5, 5 to 4, 4 to 3, 3 to 2, 2 to 1. *1: Drive the vehicle at a speed in top gear that will cause lock-up to engage. The vehicle can be driven at a speed lower than that in the above diagram under the lock-up condition. It is necessary to drive the vehicle for approximately 30 minutes to detect DTC P0711 (ATF temperature sensor malfunction).